WILLEM GERARD HOFKER | Geringer Art, Ltd.
WILLEM GERARD HOFKER (Dutch, 1902-1981). Willem Hofker was born in the Hague and first studied at the Academy of Fine Arts there and later at the National Academy in Amsterdam. He was also taught by Willem Witsen and Issac Israel who were friends of his father, an amateur artist and writer. Hofker won 2nd prize at the Prix de Rome in 1924 and settled in Amsterdam with his wife Maria who was also a painter. There they supported themselves mainly through executing portraits. 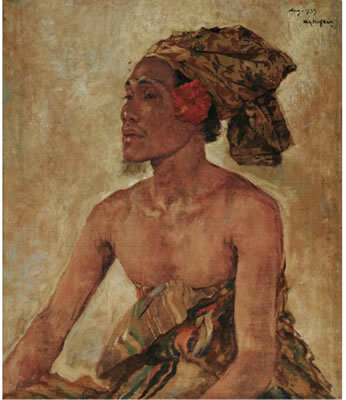 After arriving in Indonesia in 1938 he and Maria traveled extensively, sketching and painting. The Hofkers socialized with many painters including Spies, Strasser, Meyer and their good friend Rudolf Bonnet. In 1940 the couple moved to Ubud. During World War II Hofker and his friend Bonnet were forced to join the KNIL army in Subaya, and later he and his wife were interned in separate prison camps. During this period most of Maria Hofker’s paintings and sketches were lost. Reluctant to join the Indonesian nationalists at the end of the war, the Hofkers returned home to Holland where they remained until the end of their lives. While in Holland, Hofker continue to depict the people and landscapes of Bali.